Women are the greatest natural resource and gift that God has ever given to humankind. She is far more valuable than rubies and diamonds, more precious than gold or platinum. However, although her worth is unmatched, throughout the ages women have been regarded as property, treated as slaves, and even physically abused. 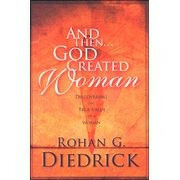 Join Rohan Diedrick as he shares insights that will bring new reality to the power and influence of a woman.